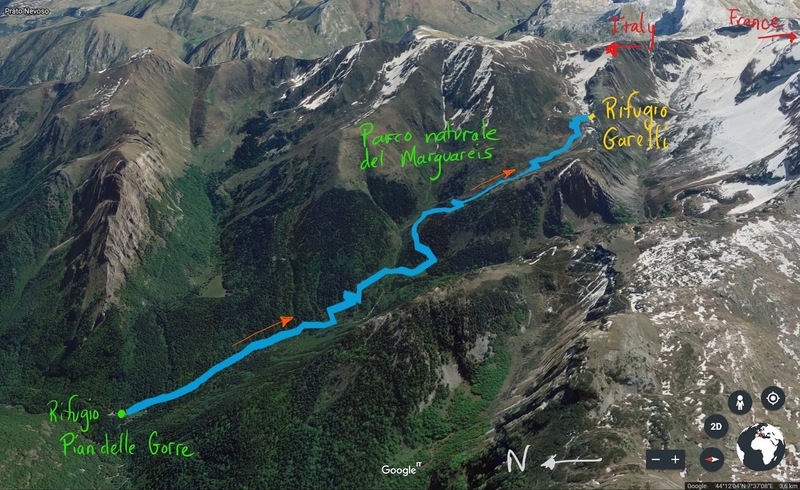 Left: Route from Pian delle Gorre to Rifugio Garelli. Right: View from Rifugio Garelli looking north into a winter haze. 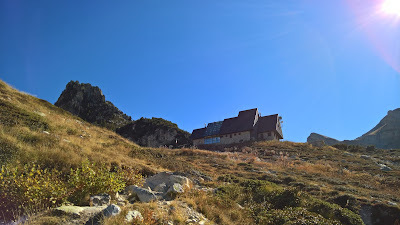 Elevation: 1032 m (3,386 ft) @ Pian del Gorre, 1970 m (6,463 ft) @ Rifugio Garelli. Total elevation gain of 938m (3,077 ft). We seem to keep coming back to these mountains in southern part of the Cuneo Province, like we have some unfinished business. This time around we were in the area to attend the Fiera Nazionale del Marrone in Cuneo, a several-day celebration of the chestnut as well as other Piemontese and Ligurian foods and crafts. A marrone is a chestnut (castagna) that is highly prized for its taste particularly when cooked. 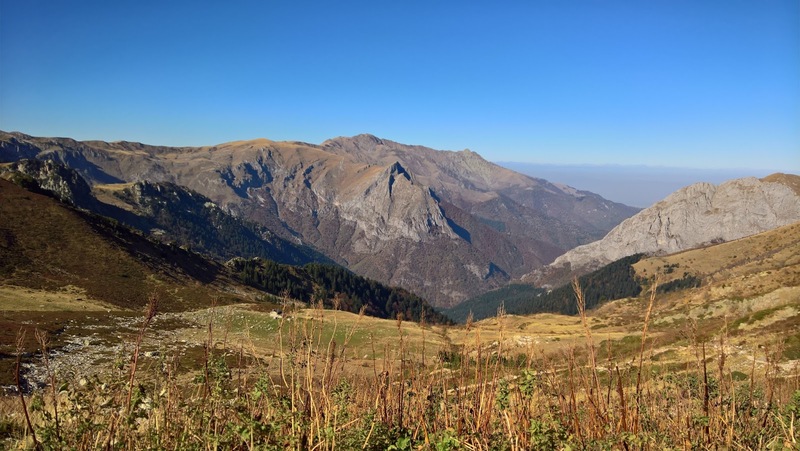 Last time we were in these hills, it was December 2015 and we did a hike in the nearby Valle Ellero (see Valle Ellero, Rastello to Cima Pigna Hike) and one hike with the same starting point as today's hike (see Valle Pesio, Pian Gorre to Cascata del Pis del Pesio). Today, we started from Rifugio Pian dell Gorre as before, but head to Rifugio Garelli instead of the waterfall Pis del Pesio. Like last time, it's also unseasonably warm. We are hiking in short sleeves. An unusual high-pressure system and little rain has led to dry, warm hazy conditions. The haze is due to particulate matter in the air that normally would be removed by precipitation which has been lacking. On this hike, we reach 1970 m (6,463 ft) and it feels like we are above the layer of ick. We drove up to Rifugio Pian delle Gorre and parked our car to start this hike. 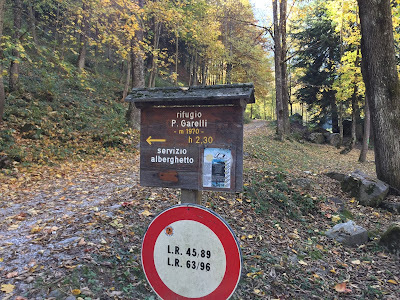 We followed the same route to and from Garelli. 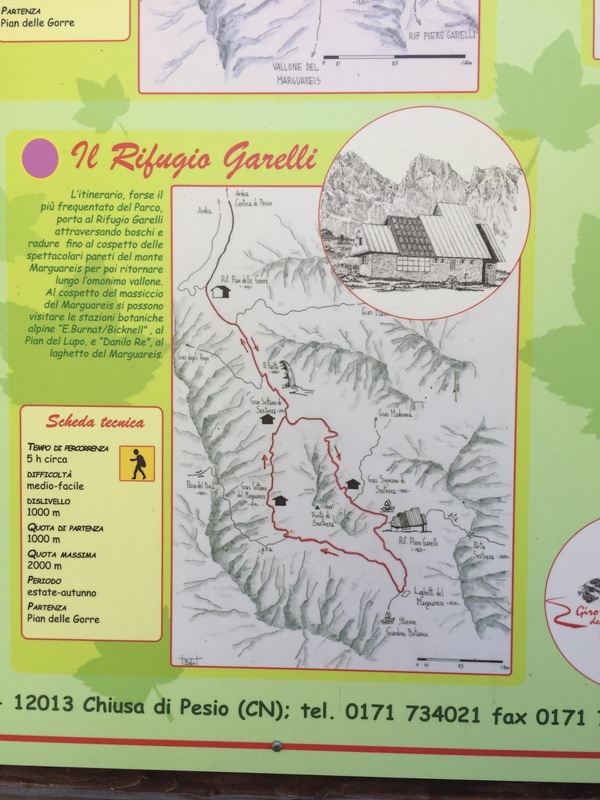 What would be nicer is to continue beyond Garelli to the Laghetto del Marguareis and make a loop following a different trail back to Gias Sottano and then on down to the starting point. (This is shown in a picture attached to this post.) 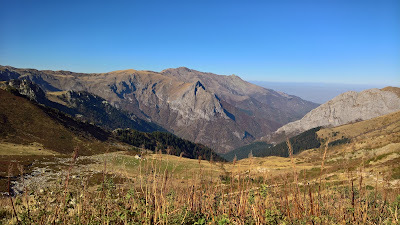 For more info (in Italian) for hikes in the Valle Pesio, see Alpi Cuneesi Escursioni e Sentieri. 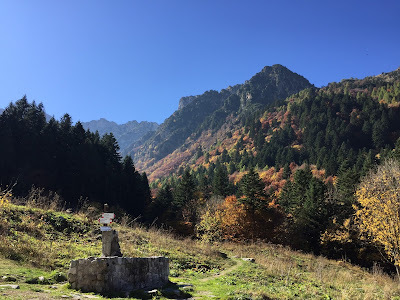 Today's hike is in the what is called the Parco Marguareis, the southwest part of the Maritime Alps, which includes the Valle Pesio and part of the Alta Valle Tanaro. The park comprises five different natural areas spread out in the province of Cuneo. 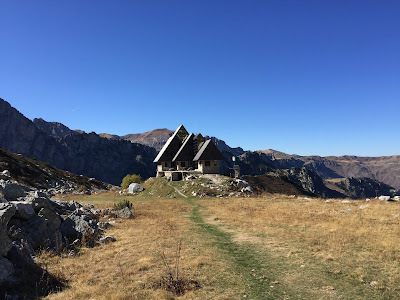 Parco Marguareis, the location of this hike and the interesting Certosa di Pesio. We have visited all parts of the park except the first (Belbo). If you are into off-the-beaten-track things to do in nature, this would be a good starting list. 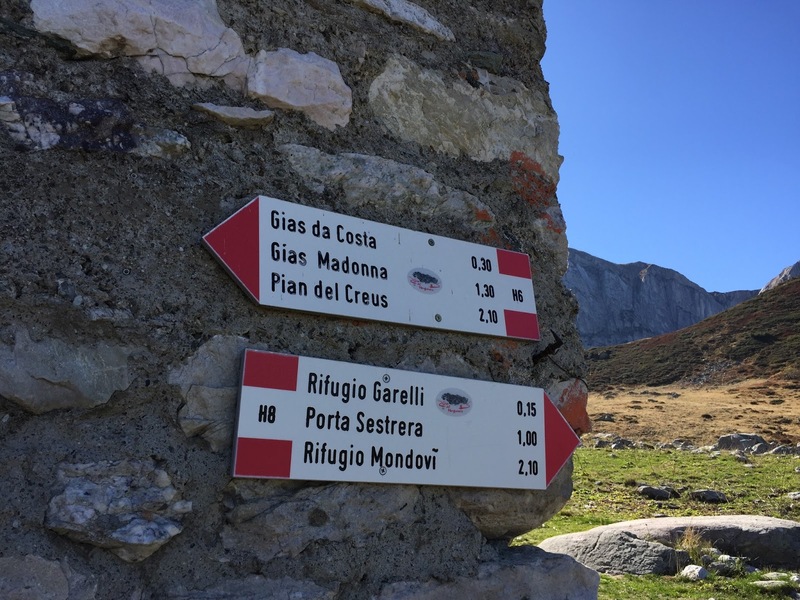 On the way to and from Rifugio Pian delle Gorre, you will pass by the Certosa di Pesio. It's worth a stop for at least a few minutes to visit the peculiar spaces. You have to really follow the signs and your nose to discover all the hidden parts of the Certosa. 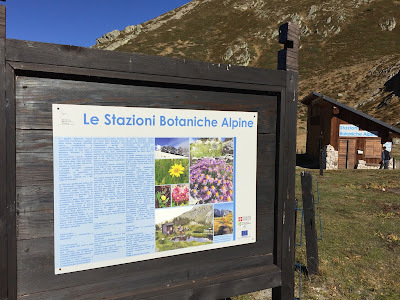 Unfortunately, there wasn't too much botanical-wise to look at on today's hike, but we did see a botanical research station near Rifugio Garelli that was very much closed for the season. Though the botanical research station as well as Rifugio Garelli were closed, the upside was complete solitude. Left: The suggested loop hike from Pian delle Gorre to Rifugio Garelli and back. 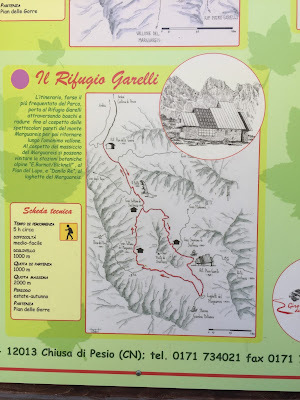 Center: Sign at the start of the hike near Pian delle Gorre marking the time to reach Garelli. Right: Signs at Gias soprano di Sestrera, just below Garelli. Left: Gias sottano di Sestrera and fountain with potabile water. Center: The striking outline of Rifugio Garelli. Right: Sign at the Botanical Station near Rifugio Garelli. 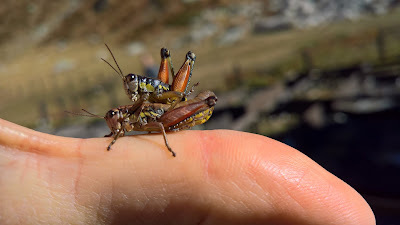 Left: Only us and the grasshoppers making love at Rifugio Garelli. Right: Rifugio Garelli from Gias sottano di Sestrera.